Wake up each morning surrounded by the stunning Sierra Nevada Mountains of Granada. Explore the ancient technologies of yoga, modern science of psychology & leadership studies while immersing yourself in vibrant and nurturing destination of Spain. 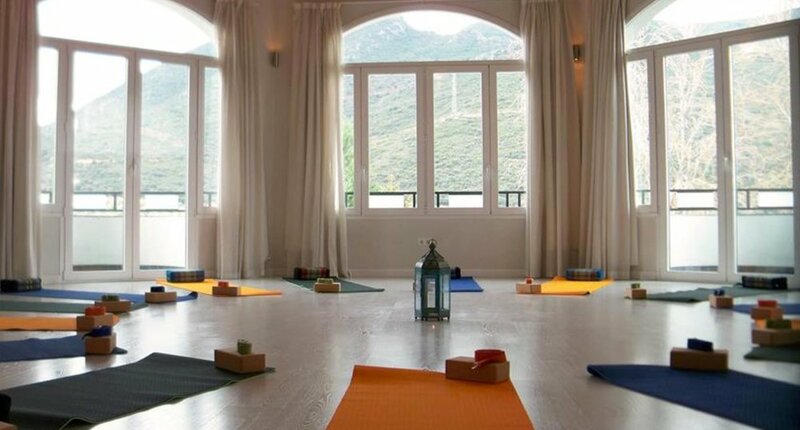 Are you yearning for some time to rejuvenate your soul while being surrounded by the beautiful and nourishing Sierra Nevada mountain range of Granada, Spain? Would you like to cultivate vitality in the body, stillness in the mind and nourishment for the soul? During Return to Yourself and Rejuvenate Your Soul you’ll drop into a slower pace of life, restoring your mind, body and soul. You’ll cultivate a deeper relationship with your embodied wisdom through transformational practices of meditation, reflection and yin yoga. Transformational practices of self-inquiry to promote soul-full healing and nourishment for your heart. Discover the art, science, and ritual of living yoga everyday to help you thrive in your modern lifestyle with greater authenticity, vitality, and joy. The Art of Yin Yoga: Yin yoga is a slow, yet powerful practice that targets the yin tissues of the body (fascia, bones, ligaments & joints), and supports overall wellness and balance. As an integrative practice, yin naturally lends itself to mindful and meditative states of mind, which can lead to full-bodied awareness and soul-full transformation. The Science of Mind-Body Psychology: The science of psychology offers you an integrative approach to relating to yourself with compassionate curiosity and provides a loving channel for transformational living and deeper inner fulfillment. The Ritual of Living Yoga Everyday: Rituals are part of everyday life and often include habits of daily living that support structure, nourishment and balance. When the practices of yoga are offered as rituals for daily living, your life becomes a prayer and everyday is an opportunity for tuning into the deeper messages of your soul to rejuvenate, to heal and to transform. Explore the vibrant culture of Spain while restoring your body, calming your mind and answering the call of what your heart longs for the most. Yes! I'm coming to Granada 2017! Your home during your Granada retreat is a newly renovated Spanish house in Pinos Puente, a sweet little countryside town that is only 15 minutes away from Granada. Close to Sierra Elvira, the Lucia Retreat Center is surrounded by olive tress, beautiful gardens, and large green spaces that are perfect for walking or hiking. • You're encouraged to unplug as much as possible and should you need to connect, the retreat center does have WiFi. -Immerse yourself in the vibrant and nurturing destination of Granada, Spain. -Discover the basic philosophy, anatomy and practice of yin yoga. -Cultivate a loving channel for relating to your mind, body and soul. - Enjoy integration time to rejuvenate, relax and immerse yourself in beauty. -Discover transformational practices for everyday authentic and vibrant living. -Learn how to create artful yoga sequences that are mindful, restoring and nourishing. Taking Kendra's classes has helped me deepen my yoga practice. It's easy to roll through a sequence of poses in a yoga class, but Kendra's instruction and guidance taught me to be more mindful and aware of my body, while exploring my edges in a helpful and healing way. Her classes are not just a workout; they're a study in understanding and befriending your body, and creating a space to embody your life on a more compassionate path. Kendra is warm, sweet, and kind. She reflects back a different, more uplifting, version of myself than the rest of the world. She exposed me to new perspective changing ideas and resources that have supported me during deep transformation and growth while stepping more fully into my womanhood and dharma. Remember, the goal is not to tie ourselves in knots—we're already tied in knots. The aim [of yoga] is to untie the knots in our heart. The aim is to unite with the ultimate, loving, and peaceful power of the universe and fully awaken into the highest level of human consciousness.